I've written a lot (a lot) about why it's wrong to put Chanel, and even Chanel plus Poiret, up on a pedestal as the pivot(s) of a sharp turning point in fashion, but I've only touched on Dior and the New Look once or twice. Just like the earlier narrative compresses time to juxtapose frothy Edwardian gowns against the short, narrow dresses of the mid-late 1920s, the centering of Christian Dior as the inventor of stereotypical 1950s fashion in 1947 is a big oversimplification. 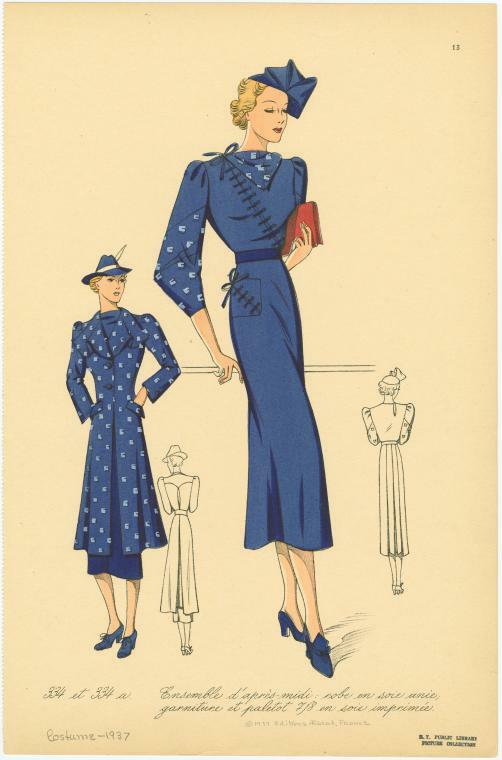 In 1938, however, the skirt was shortened to hit below the kneecap, while high fashion in 1939 added flare to the hem. The width of the outfit at the shoulders and knees was balanced by a narrow waistline - the silhouette was an hourglass. "Vestee Suit", Pearl Levy Alexander for André, Sept. 1939; NYPL - very similar to a design by Dior for Piguet in 1938! Clothing was regulated during the war years, in order to ensure that there was enough fabric to go around for the war effort, and as a result fashion "froze" - and even moved back, to some extent. The US War Production Board announced strictures regarding yardage, number of buttons and pleats, amount of stitching, etc. allowed on a garment in April 1942. Clothes rationing in the UK had been announced in June 1941, allowing hardly more than one new outfit or garment per year, and commercially-made clothing had to follow similar regulations, as did homemade and bespoke clothes after May 1942. Even neutral Ireland introduced rationing for clothing in June 1942, and fashions generally followed the lines of British "utility dress". 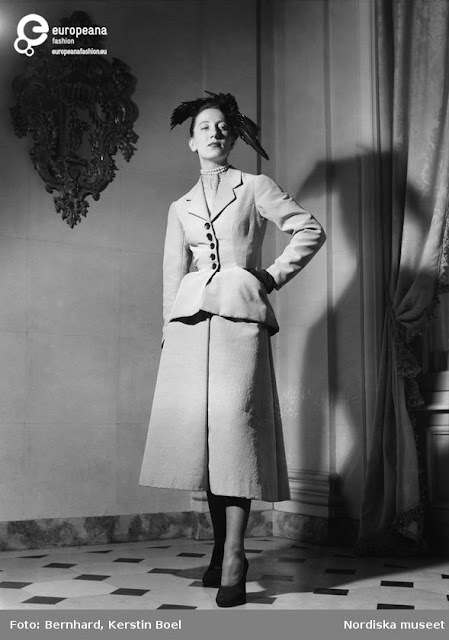 In France, fabric was hard to come by from the beginning of the war, causing the spring/summer 1940 collections shown in Paris to be somewhat skimpy, and in January 1941 (under the occupation), a very strict rationing system was introduced. Not everyone followed the regulations: there are numerous examples of extant American clothes from the war years that show supposedly banned notions like fabric-covered buttons and zippers. Still, the shape of the fashionable skirt changed across the West to have less fullness, something more like the silhouette of 1938 but still with a slight flare at the knee. 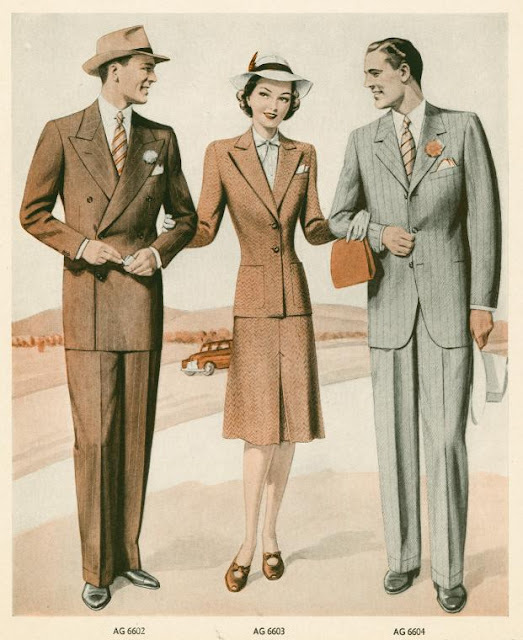 The fashionable jacket of the period was typically long, often with the hips emphasized by patch pockets and the waistline tailored in - also similar to late 1930s styles. These restrictions lasted beyond the length of the war in Europe: Irish clothing rationing would not end until 1948, and British rationing until 1949. The haute couture industry, however, bounced back relatively quickly. Its needs had bypassed rationing, although it had never flaunted that fact by showing designs based on a silhouette that was wildly inaccessible to the average person, and it was needed to encourage the wealthy to keep adding to the economy. 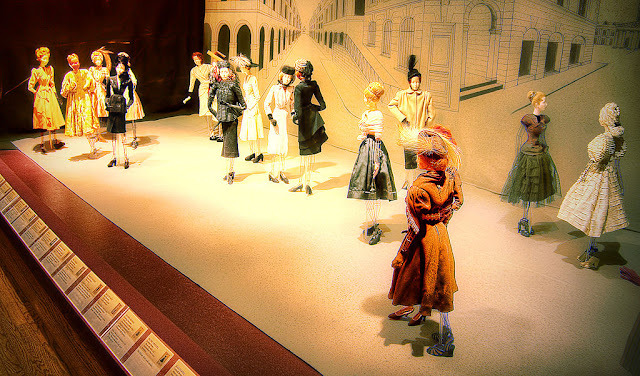 While many of Paris's fashion houses had shut down during the occupation due to a lack of customers, the couturiers returned in 1944-45 to produce the Théâtre de la Mode, an opulent traveling fashion show done at a doll scale. 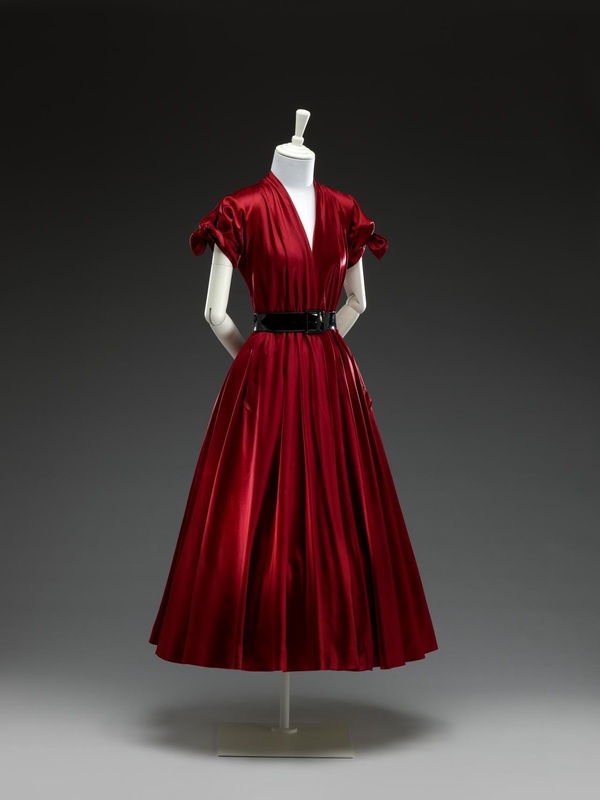 Following the production, the couturiers re-dressed the dolls for 1946 and sent them abroad. (They are now at the Maryhill Museum, which has a video showing many of them dressed and posed.) The Parisian fashion industry then went back to full-scale, twice-yearly fashion shows and regained its prominent place in the market. 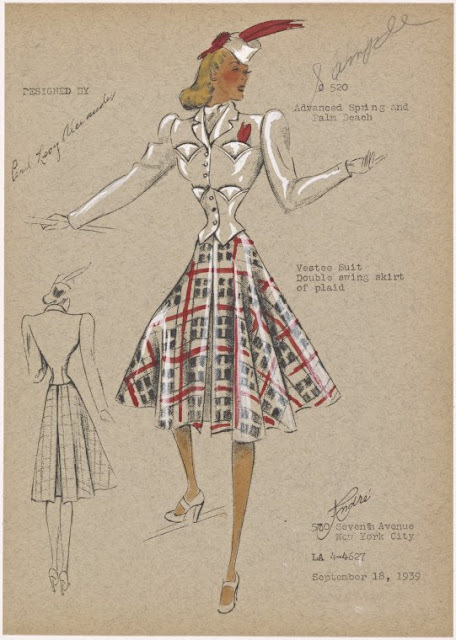 What is particularly important about the Théâtre de la Mode clothing is that the designers stepped back to 1940, picking up where fashion had paused as governments regulated the sweep of a skirt and the fullness of a sleeve. 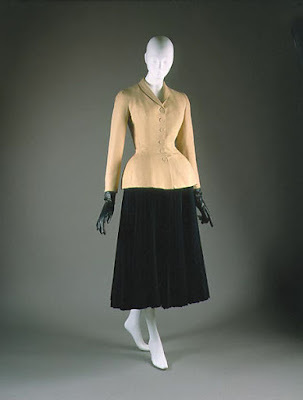 These garments - the collaborative work of more than fifty couturiers, including Dior, who was working for Lelong - very frequently show the luxuriously wide hemlines (as well as very narrow ones) that would become everyday dress in the coming years. Christian Dior's first fashion show under his own name was in February of 1947, not very long after the Théâtre. This is the show where he premiered his Corolle and En Huit lines (the former with full skirts and the latter with pencil skirts), which contained the famous black and white Bar Suit and is said to have prompted Carmel Snow to declare that he had created a "new look". with styling appropriate to that year rather than 1947. ... almost all of the new Paris collections have this in common: they start no revolutions, but rather make new use of fashion themes that have been crystallizing for seasons past, and which look fresh and inviting. Something I've discussed before when it comes to the early 1920s is the popular tendency to take primary sources at face value. If a columnist in the London Times in 1921 complained that young women were going out at night barely dressed, this is often taken as meaning that young women in 1921 could not get less covered up, when in fact there was still room to keep going in that direction - it's just that commentators were coming from a different context and couldn't see the future. Likewise, the changes that occurred between 1945 and 1955 get squished into this one fashion show in pop culture because commentators in early 1947 described the changes occurring as major, as they obviously couldn't tell that styles would continue to develop in the same direction to an extreme. They called the fuller skirts of 1947 "bouffant" because they were puffed out in comparison to the earlier straight ones, but the skirts that are bouffant by our standards, springing out from the waist in a wide froth of petticoats, did not come in until late 1951. The shoulders of suits and dresses in the 1947 shows were less wide than in the war years, but their sleeve heads were still usually well out on the shoulder and often padded or structured to give a firm counterbalance to the skirt and draw straight, diagonal lines down to the waist. This also lasted for some time, eventually phasing out as more and more dresses were made with wide necklines and/or without sleeves. A few sources - good reading! Remember, I've reopened my Patreon! As of its reopening, I've changed it to pay per post rather than per month, so something like an automated tip jar. The posts that will count as paid will be those that include a pattern of an extant garment or are based on research, like this one. Posts about sewing projects, translations, or attending events will continue to be published without charge. What a lovely and informative post! I was nodding right along with you until the fashion doll collection - I'd never heard of them! Thank you! If you want some more detail about the dolls, Katy Werlin wrote a post about them some times ago (scroll past the 18th century section).